Intimidation Clothing is pleased to announce the addition of a new dealer to its growing list of retailers across the country, as Michigan Top Team in Dearborn, Michigan has joined Team Intimidation. This new great Midwest addition joins over 50 other outlets across the country and around the world where fans can purchase Intimidation gear. Michigan Top Team is a Mixed Martial Arts (MMA) and fitness based gym. They offer a wide variety of classes for all ages, genders, and goals. MTT was founded in 2013 by professional fighters Daron Cruickshank, Jason Fischer, and Cody Stamann, and is the home for Michigan’s top MMA professional and amateur superstars. This combination of an experienced coaching staff and positive environment makes MTT anyone’s best choice! The gym features many notable fighters, including Intimidation alum and current UFC lightweight contender Daron “The Detroit Superstar” Cruickshank, current Bellator lightweight Jason Fischer, top 135-145 pound prospect Cody Stamann, multi-time Bellator veteran Josh Burns, MMA veteran Bo Harris, MMA veteran Josh Robinson, and many more. The addition of Michigan Top Team to the list of Intimidation retail stores and dealers comes on the heels of Intimidation Clothing’s second straight sponsorship of a WXC MMA event in the Detroit area after years of hard work building the brand by Shad Thomsen and the entire Intimidation Clothing staff. Intimidation Clothing is pleased to announce its sponsorship of the upcoming “WXC 52: Evolution” event, which is set to take place at the Southgate Civic Center on August 15 near Detroit, Michigan. WXC is one of Michigan’s longest running and most successful organizations, hosting regular events featuring some of Michigan’s finest amateur MMA talent. The organization started in 2008 on the heels of the UFC’s first entry into Michigan, and has been promoting events since. The WXC 52: Evolution event is set to feature 15 bouts, including the organization’s first all-pro lineup. The main event features Intimidation sponsored David Evans (2-1) taking on DeQuan Townsend (7-2) for the WXC welterweight title. In addition to sponsoring the Evans, Intimidation is also set to sponsor Bellator MMA veteran Eric Moon (14-12-1) and “The Ultimate Fighter 15” veteran Chris Tickle (8-7) at the event. The sponsorship of the event continues Intimidation’s foray into Michigan, which has been spearheaded by fighter turned Intimidation rep Shad Thomsen. 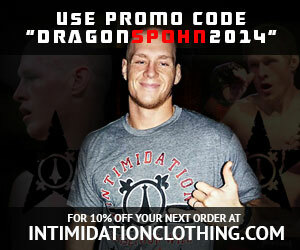 In addition Intimidation has sponsored events across the state including XFC 27 in Muskegon last December. Intimidation Clothing is pleased to announce its sponsorship of 3 standout professional fighters at this weekend’s “WXC 52: Evolution” event, which is set to take place near Detroit on Friday. Intimidation is set to sponsor headliner David Evans (2-1), Bellator MMA veteran Eric Moon (14-12-1), and “The Ultimate Fighter 15” veteran Chris Tickle (8-7) at the event. Evans will compete in the main event, as he faces XFC veteran DeQuan Townsen (7-2) for the WXC professional welterweight title. Evans has posted impressive wins in his last 2 outings, including a 39-second knockout last November. Moon is one of the most recognizable fighters in Michigan, having competed all over the state and around the country. He’ll take on Quartus Stitt (7-6) at WXC 52, as he looks for his third win in his last five outings. The Chicagoland area native Tickle competed on TUF 15, where he made his way into “the house” with an impressive 24-second TKO victory. In addition to Tickle fighting on the pro card, his fellow TUF 15 friend Daron “The Detroit Superstar” Cruickshank, an Intimidation alum, will also be in attendance. He is looking to gain footing since his time on the show, as he’ll face Andrew Morais (3-1) in a featured pro bout at WXC 52. WXC is one of Michigan’s longest running and most successful organizations, hosting regular events featuring some of Michigan’s finest amateur MMA talent. The organization started in 2008 on the heels of the UFC’s first entry into Michigan, and has been promoting events since. The WXC 52: Evolution event is set to feature 15 bouts, including the organization’s first three pro fights in which Intimidation will have a sponsored fighter in all three fights. Intimidation Clothing was busy as always this past weekend, with two events sponsored in two different states to close out a banner month of May. Intimidation was on hand at RFO: Big Guns 13 in Mansfield, Ohio on Saturday night, selling gear at an official booth where promoter Matt Trukovich posed for a quick picture (right) on a busy night. The fight card produced as always, including a victory for All American J.D. Ramsey (3-0) in the night’s featured amateur bout. Ramsey, who is sponsored by Intimidation and trains with fellow Team Intimidation member and UFC veteran Branden Hinkle, kept his perfect record intact with a unanimous decision victory over the highly regarded Nick Stuff (6-2) in the amateur main event. Intimidation was also on hand at the WXC 50 event near Detroit on Friday night, once again increasing the brand exposure in the state of Michigan. Fans packed inside the Southgate Civic Arena, many of them donning Intimidation gear and witnessing 15 amateur bouts on the night. Intimidation alum Stipe Miocic was perhaps the biggest MMA star of the weekend, as the former NAAFS champion moved his UFC record to 6-1 as he stopped Fabio Maldonado via TKO in just 35 seconds in the main event at the TUF Brazil 3 Finale. The former Cleveland State wrestler and baseball player was sponsored by Intimidation in multiple fights prior to entering the UFC. Miocic (pictured, left) will be a special guest alongside fellow Ohio fighter and Intimidation alum Jessica Eye this weekend at “Driven MMA presents NAAFS: Fight Nite in the Flats 10” in Downtown Cleveland, this weekend as will TUF 19 star Dan “Dragon” Spohn. Intimidation will of course be on hand as a sponsor of the event with an official booth with Spohn joining the fans at the Intimidation booth to sign autographs. Team Intimidation fighters Kyle Rozewski, Jerrell Hodge, Isaiah Chapman, and Frank Caraballo will also be in professional action at the event. Intimidation Clothing is pleased to announce its sponsorship of the upcoming WXC 50 event, which is set to take place at the Southgate Civic Center on May 30 near Detroit, Michigan. WXC is one of Michigan’s longest running and most successful organizations, hosting regular events featuring some of Michigan’s finest amateur MMA talent. The organization started in 2008 on the heels of the UFC’s first entry into Michigan, and has been promoting events since. The WXC 50 event is set to feature 15 bouts, including 3 title fights. The main event features Taylor Moore taking on Jerome Otler for the organization’s lightweight title. In addition to sponsoring the event, Intimidation will also be on hand selling its popular brand of t-shirts, hats, hoodies, and more.